If you need dentures because you are missing all of your teeth, you don’t have to feel like you only have one option. One of the methods that works well and solves a number of problems that denture wearers complain about is called implant overdentures. With this procedure, two or more dental implants are placed into your jawbone and your replacement teeth are secured over these implants. This option is more comfortable and functional than completely removable dentures. 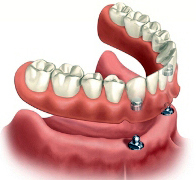 One type of overdenture is called the snap-on denture which is shown in the diagram to the right. This appliance is removable and is comprised of a complete denture that snaps into place and is firmly held in place by two dental implants. It is securely anchored into your jawbone, which means the area of bone right around the dental implants will not be resorbed, helping to prevent facial collapse. If your budget is an issue, the snap-on denture is the most economical option. We can always add additional implants at a later time to improve functionality. The cost of this treatment is largely dependent on the number of dental implants used. Another type of overdenture is one that uses screws to attach to the dental implants. No matter how tight your dentures fit, they have many hindrances. This is mainly due to the fact that they are a removable appliance that rests on your movable gum tissue. You can be confident that they will not move around while eating or talking. Your chewing efficiency is improved so you can eat normally. There are circumstances in which you can keep some of your healthy teeth. Most importantly, they prevent bone loss in the area right around the dental implants which helps prevent facial collapse. Additionally, Dr. Noah received his fellowship with the American Academy of Implant Dentistry. This certification requires extensive training and approval by the American Board of Oral Implantation. This expertise means that he can help you better understand all of your options and determine the right solution to meet your budget and individualized needs. If you’d like to see if you’re a candidate for implant overdentures, you may schedule a complementary consultation with Dr. Noah, where he can answer your questions by calling (918) 742-5521. If you prefer, you may click here to request an appointment online. Our implant services are generally handled at our Tulsa Midtown location.